Spinach is already known for being an excellent source of folic acid and protective chemicals that are beneficial for eyesight and other eye-related conditions, as well as having anti-carcinogenic properties. In fact, previous research has identified at least 13 different flavonoid compounds in spinach that function as antioxidants and as anti-cancer agents. Researchers have now discovered that eating a bowl of spinach a day makes muscles "profoundly" more efficient. They found that eating 300g of the vegetable reduced the amount of oxygen needed to power muscles by as much as five per cent when exercising. The effect was so powerful that it worked after just three days. The researchers fed people pure nitrate supplements - the equivalent to the amount in a plate of spinach - every day for three days. At the beginning and end of the experiment they were made to pedal strenuously on an exercise bike while their oxygen intake was measured via a tube to the mouth It was found that the difference in energy intake was between three and five per cent - a significant figure. The scientists said that the results may offer one explanation for the well-known health benefits of fruits and vegetables, and leafy green vegetables in particular. "We're talking about an amount of nitrate equivalent to what is found in two or three red beets or a plate of spinach,"
"We know that diets rich in fruits and vegetables can help prevent cardiovascular disease and diabetes but the active nutrients haven't been clear. This shows inorganic nitrate as a candidate to explain those benefits." 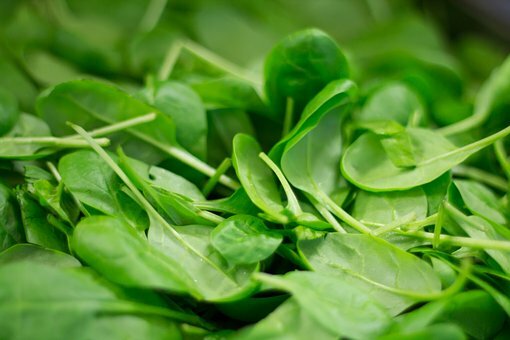 Scientists discovered that it is not iron but nitrates which are abundant in spinach and that are responsible for its health benefits. These chemicals make the mitochondria - the "engine rooms" of every cell - more efficient, they found. "It is like a fuel additive for your muscles - it makes them run much more smoothly and efficiently," said the lead author of the study. Mitochondria, like all engines, lose a lot of energy through heat loss. The nitrate seems to stop this waste and make the cell - and so the muscle - run more efficiently. Spinach is an extremely versatile vegetable. The baby leaves can be eaten raw in salads, or it can be wilted or steamed, and served as a side dish with butter and spices. Larsen FJ, Schiffer TA, Borniquel S, et al. Dietary Inorganic Nitrate Improves Mitochondrial Efficiency in Humans. Cell metabolism, 2011; 13 (2): 149-159.